11th February and mild weather brought the first sighting of frogs on our ponds, I counted 10 on that day. By the next day there were several dozen swimming about, although you could not here much in the way of croaking at that stage. However, the following days saw a return to colder weather and the frog activity ceased as quickly as it had started. 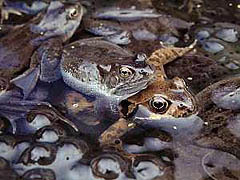 6th March brought a return to milder conditions and the re-emergence of the frogs. Their croaking continued late into the night. The next day saw more arrivals and a great deal of activity in every corner of both ponds. I was able to count 70+ frogs on the 9th March. Frantic pairing tussles were taking place all over the pond and during the day the first small clump of frog spawn appeared. Over the next few days the spawning action was concentrated at the shallow end of the pond so that by the 12th March the spawn covered several square feet. During the evenings I have been standing outside listening to the sound of the frogs. At it's peak the croaking was continuous for hours on end. More spawn was also appearing in the deeper part of the big pond now, in the part that was the the main spawning area last year. On the 13th March I caught my first glimpse of a newt in the pond as it popped up to the surface to breathe in the middle of a group of frogs. The newts bred very successfully last year so I hope to see a lot more of them as the season progresses. By the 14th March there was definitely less croaking and the frogs did not seem to be chasing each other with the enthusiasm seen just a few days ago. When I looked out I could see dozens of frogs but they were all just 'hanging about' and for much of the time the water surface was still. 16 March - There is still some mating action going on in the pond, but I think that most of the frog spawn has now been laid. Image of the day has to be this one of the first toad to be seen in the garden this year. The trouble with arriving alone at a pond full of frogs is that anything that moves gains a friend! While the toad looks completely disinterested the frog hangs on as though it's life depends on it. 17 March - Heavy rain last night filled the big pond to overflowing. Today, colder temperatures seem to caused an almost complete stop to fog activities. 18 March - The cold weather (max 5C) does not encourage frog activities! I have only seen one near the surface of the pond all day. 19 March - Not even one sighting today! The pond seemed to stay still all day, except for the time when it was used for bathing by starlings, sparrows and the blackbirds. 20 March - Not just cold (max 1C)but snow today, and no frogs or other animal sightings in the pond today. 22 March - With the air temperature up to 8C by 9.30am there are frogs appearing again in both ponds this morning. By the afternoon the temperature was up to 13C and the frogs were popping up everywhere in the ponds. It is funny that even though they do not spawn in the small pond there are always quite a few frogs in and around it throughout the spring and summer. Whenever there is a glimmer of sunshine you are sure to find them sunning themselves, often in groups, on the vegetation that borders it - these three are in a typical pose. There were four others just out of shot. It was good to hear the croaking again today. 23 March - A wet day today with the temperature dropping back under 10C and only limited numbers of silent frogs in sight. Here is a close-up photograph of some frog spawn (left). This would have been laid around the 12th March. Out in the garden this evening with headlight on, I counted at least 16 newts patroling both ponds. This was my first chance to get a newt picture this year. 24 March - Another dull day with air temperatures staying under 10C has seen the frogs disappear again! There has been not a ripple as I walk pass the ponds. I spent a little time having a look at how the pond plants are doing, there are plenty of signs of growth already. There are quite a few Ramshorn snails grazing on the plants and their shells suggest that there has been some recent growth. The shell of this specimen is about 1cm across at the widest, although there are much larger specimens in the pond. I have included the second picture that shows the foot that extends back under the shell. 25 March - Temperatures continue to stay low and so frog activity was very limited. An inspection of the pond after dark revealed seven frogs at or near the surface. The newts were more active as they moved in and out of the submerged plants near the edges of the pond. Here is a male, you can see the outline of the small crest along its back. It's hind feet seem to be somewhat webbed which suggests that it is a palmate newt, but I will need to get a couple more photographs of the males to see more details before I am sure. While I was outside I think that I heard the squeaky call of a toad for the first time this year. I have not seen any toad pairs yet. I usually go out into our road to help them across and up the kerbs at this time of the year, but a quick check out there revealed none tonight. 28 March - Some sunshine this morning was enough to start bringing the frogs back to the surface. The last couple of days say only occasional sightings of them and even newt activity was very limited. Here is an image of the same bit of frog spawn seen on the 23rd. Development is well under way. In the closeup you can see the growing tail, curled round, and the external gills starting to form. Each embryo is 5-6mm long and some of them move when the spawn is disturbed. When I returned the frog spawn I found some lake limpets (Ancylus lacustris) on a piece of plant stalk that I removed from the pond. There is a large population of these in the big pond. Each one measures just under 5mm long. The inset shows one with its shell raised to expose its foot. Notice the 'hooked' top to the shell. 29 March - Nothing of note today, although I was surprised that even with warmer weather and sunshine the frogs stayed largely out of sight. As a result of a newsgroup posting I have added a picture of a grey wagtail to the 'Wildlife Pictures' page. This was one of the first visitors I had to the small pond, not long after it was set up some seven years ago. The grey wagtail is not normally associated with garden ponds, so it was quite a surprise, especially when it stayed for five days!